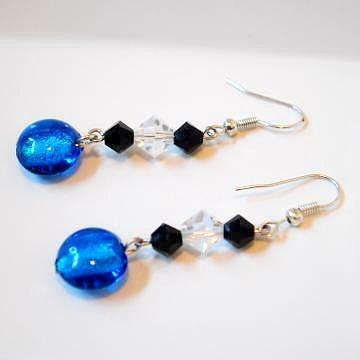 Everyday elegance is yours with these blue dichroic lampwork earrings. These earrings have Native American seed beads as an accent. These silver foil puff coins are formed of transparent glass in blue. Each lampwork piece has been coated with dichroic, which imparts a metallic oil slick effect through the center of each puff. Pair these earrings with anything from an evening gown to your favorite jeans. Unleash your inner diva! Shock your conservative look with the bold design and eye-popping color of these glamorous shimmers. Each earring is embraced with black bicone Crystazzi Crystals and clear Swarovski Elements bicones.